It shows if real-time protection is on or off, and allows you to turn each module on or off by simply clicking on the icon. Note: If the icon is disabled, then the software has not being activated or the feature is not included in the version you have installed. It also shows you the latest detected processes, accessed registry areas and blocked IP addresses. Click “Export Detailed Log” to open a text log file which includes the full list of blocked processes, registry areas or blocked IP addresses. 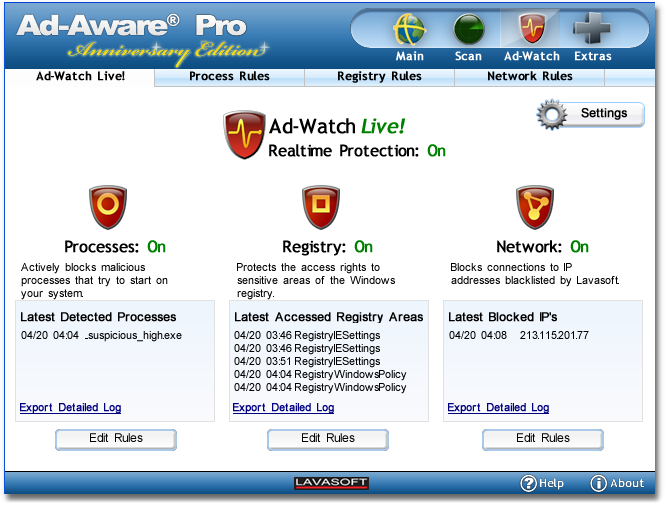 What Is Ad-Aware Anniversary Edition?